The largest, strongest, most heavily armed and armoured battleship ever to float the world oceans the Yamato class started it's design life as an even larger ship with a length close to 300meters, an all forward main gun arrangement but similar weaponry and armour. The Superstructure and the deck structures were different in this early phase of development but the tall pagoda style superstructure was evident which was later redesigned. This ship would had been a fast vessel with 57km/h (31knots) top speed, good range and excellent stability! Design choices can be seen here: to protect the AA guns both heavy and light as well as the the aircrafts, the main guns and secondary guns concentrated on the ends of the hull putting their blast effects far from these sensitive equipment. The aircrafts were stored in a protected hanger under the deck and behind the 155mm turrets with a ramp serving as an access to the catapults. The Light AA guns mounted high on the superstructure to provide clear arcs of fire as well as distance from the main guns blasts. Similar was the decision to put the boat storage under the hull but still outside of it at the aft parts and both sides of the main deck similarly on what was chosen for the Yamato, only difference is the size, as this was a larger ship the boat storage was much longer. While this was the very first design leading to the Yamato class, it was the only one to feature the 50 calibre 46cm cannons. After evaluating the design it was found (among other things) that the Arms industry of Japan could not produce such long barrelled guns hence the change to the 45 calibre one on the later designs. Other critical points were the large size both hull length and displacement wise as there were no docks capable holding the vessel for outfit, refit or repair works. I've choose fully enclosed 127mm gun turrets as to not protect them from blast effect (Though at extreme aft firing the 3rd turret's gun might effect them! ) but to protect them from light bombs and strafing fire of enemy aircraft. Angled funnel of the Yamato because all the boilers were located under the tower like pagoda superstructure with the turbines behind them. 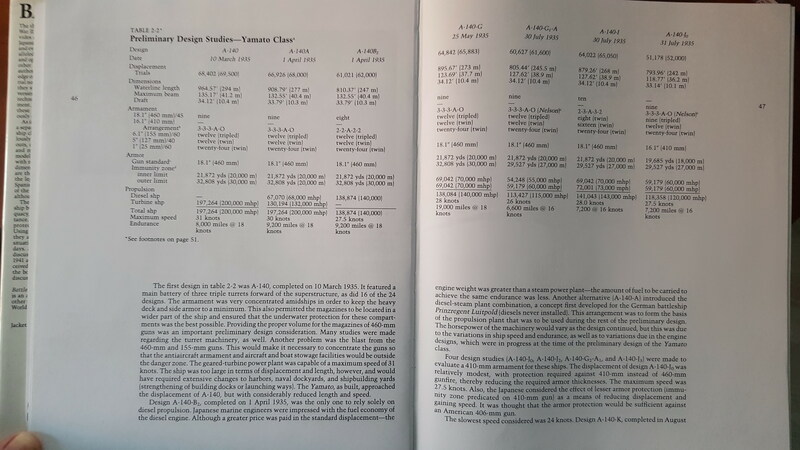 When the A subvariant of the A-140 design process finished, two further variants were made showing the effects and looks of different layouts of the weaponry. On variant A1 the 3 triple turrets were distributed in a classical way of two forward, one aft and secondary turrets adjusted accordingly to provide the broadside of at least 3 turrets. On variant A2 the 3 triple turrets were changed to 4 twin ones distributed evenly forward and aft in superfiring pairs. While the firepower was reduced by a single barrel this layout allowed for a better firing pattern of the main guns making ranging shots much better than with 3 triple turrets. While the very first Yamato preliminary the A-140 was a large and fast ship with an all steam turbine propulsion and the A variants were smaller and slightly slower designs with a mixed Diesel and Steam Turbine propulsion the B variants were even smaller and thus slower proposals but with a full Diesel propulsion system which seemed ideal for a Navy to travel long distances on the surface of the Pacific Ocean like the Imperial Japanese Navy. These designs were 30m shorter than the A variants but maintain the same armour, armament and general layout though the lack of a large funnel meant a considerable space could be allocated on the centreline thus the concentrated heavy AA weaponry there. Similar to the A-140A1 version, the B1 variant is the all diesel version of that proposals on the same shortened hull as on A-140B with the conventional layout of 2 main turrets forward, 1 aft, and the associated changes to the secondary 155mm armament as well as the 127mm heavy AA armament creating a compact looking battleship. 4 twin turrets distributed evenly forward and aft together with the changes in the secondary armament. AA layout is the same as on the plain B variant. While for the previous designs there were sketch drawings I could use to make my drawings starting with the C variant I could only use others imaginations and ideas of how the various designs would look like. Except for the Design A-140 as I did not found a sketch for it as well only for A-140A. Now about the actual design. Version C is literally a copy of the plain B variant but with a reduced engine output and thus a slower speed. A true slow battleship though the saved weight was only 2.000tons due to the smaller engines installed. I've slightly changed the AA layout to look different and not as the same as the B version. Similar to the C version, for the D version too I did not found any sketch drawings so I used my imagination and own ideas to make a unique design. Being as the same size as the B version with the same armament and engine power but 5000tons lighter and one knot faster meant a more efficient hull form must had been chosen by the designer hence I too choose a hull more similar to the Final Yamato design (A-140F6) than of those of the previous ones proposals. The same way I chose a different layout for the secondary and AA guns as well. Unlike to the previous versions on this design 41cm cannons were chosen as main armament rather 46cm/50 ones, and armour was reduced accordingly. With the F series starts the final variants leading to Yamato class battleships, these designs were very similar, all feature the 3 turret evenly spread layout of 2 forward 1 aft finalyl chosen for the Yamatos, though this design was the only one feature 8 guns instead of 9. Though not the smallest in the F series, this design was the lightest among them with only 60.350tons displacement. Sidenote: This is the last design for which I've choose the mixed Yamato-A-140 hull, the follow on designs all will feature the Yamato's hull. 3 triple 46cm turrets: 2 forward 1 aft, rhomboid position of the secondary turrets aka 2 on the centreline superfiring the main turrets and 1 wing turrets on each side, above them were the main heavy 127mm AA gun turrets on the sides. 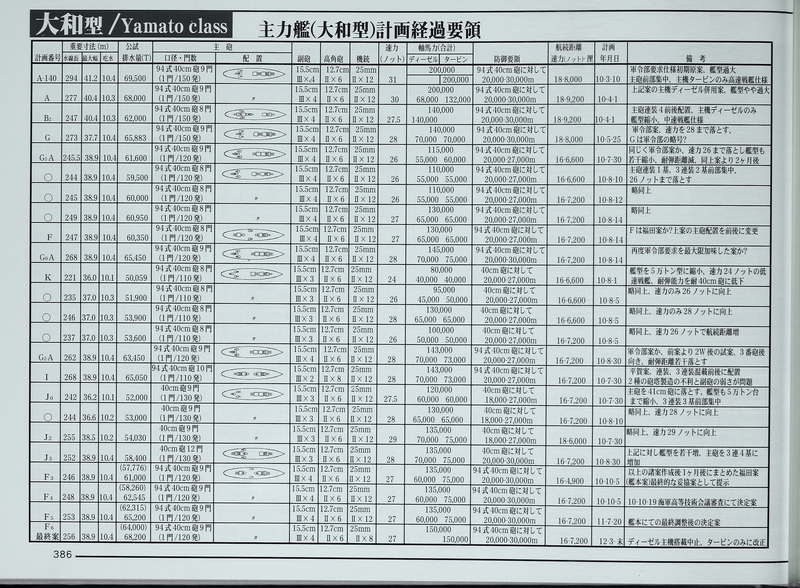 Characteristically this is a shorter Yamato with shortest operational range among the preliminary designs with only 9.100km or 4.900nm which allowed a few thousand tones to be cut down! While the F3 variant was a short ranged design with only 9.000km (or 4.900nm) range the F4 was an improved 2m longer version with a much better range of 13.000km (or 7.200nm) which stayed till the final design. But this extra 2 meters and larger bunkerage made the design almost 500tons heavier while otherwise it remained the same as the F3. Apparently F3 and F4 were twin designs both proposed at the same date, most likely F3 was to show how much tonnage and length could be saved if operational ranged was reduced by a 3rd. After the F4 version a longer period of time elapsed in which the admiralty evaluated the various proposals made in 1935 and in the end the choose that the F3/F4 version was to be developed further thus creating the F5 variant in the summer of 1936. This meant that the final Yamato class battleships had to have 3 triple 46cm turrets 2 forward 1 aft, 4 triple 15,5cm secondary turrets, 6 twin 12,7cm DP-AA turrets and an armour protection against their own shells between 20 and 30km range. Streamlining the F3 and F4 versions and fixing the issues with those designs (short range, and ineffective hull to beam ratio) created the semi-final Yamato design. Everything except for length, displacement and engine power / engine types, this design was essentially the Yamato class battleships one on one. Main, secondary and AA Armament, their layout, armour, and speed were all the same. Engines were still the mixed Steam Turbines and Diesel engines, which was later changed to an all turbine arrangement because the issues of servicing and replacing the diesel engines behind the thick deck armour plates and of which were considered not entirely reliable compared to the steam turbines. The largest battleships ever to float the world oceans, the 65.000ton, 263m long 460mm armed warships: IJN Yamato and IJN Musashi. This drawing shows the final design as the two ships were commissioned and as originally planned how all 5 ships should had looked like. Though Musashi commissioned with a slightly lighter light AA armament, Shinano was redesigned to a different protection scheme and AA armament and later finished as an aircraft carrier of massive size, not surprised until the 1950's by the Forrestal class Super carriers! These battleships were well protected exceptionally armed large vessels, the jewels and prides of the Imperial Japanese Navy, designed for the doctrine of Peace Goddesses where these large ships though numerically inferior but firepower and armour wise superior to anything the allies especially the USN could build, and their own existence would prevent an eruption of a naval war! Sadly neither ships could showcase it's abilities against other battleships as both sunk by immense amount of airpower. But their legacy as the largest battleships ever constructed still lives, their size, beauty and raw firepower still catches the eyes of naval enthusiasts today! They are my favourite class of battleships too! Design wise the change from the previous F5 design was the implementation of a full steam turbine drive and increasing it's output to 150.000shp from 135.000shp. 3m longer hull and the minor details the engineers ironed out. With the G series of designs start a line of the Yamato design process which was considered experimental studies or proposals from the creator Keiji Fukuda. These proposals show a variety of designs (G, G0 through G5) with various sizes to save weight, with reduced armour or gun number and gun layouts. Like on the previous design, this was too an experimental proposal. Apart from the visual change of different turret layout front (3rd turret facing aft), on this variant the reduced engine power of only 115.000shp and shorter but beamer hull meant a slow battleship and together with a reduced armour created a design which was 4.000tons lighter! This meant a cheaper ship but it could still maintain the same amount of firepower and almost equivalent defensive properties of the series starter A-140G proposal. Compared to the previous B version, variant C sacrificed a triple 155mm gun turret aft for an extra 1100km or 600nm range. Though to maintain the same speed without increasing the engine power of the design, 1m extra length was added which together with the more fuel oil increased the design's displacement to 60.000tons. Other then these changes the design is the same as the previous A-140G1-B. But to not to look too similar the two proposals, I've changed the heavy AA arrangement to 2 centreline and 2-2 broadside ones. The D variant is the last known sub variant of the G1 series of Yamato preliminaries with the only changes of a longer hull and stronger engine to further increase the speed, now from 26 to 27knots or 50km/h. Otherwise the same as the previous sub variants. The A-140G0-A was not the last but among the largest proposals of the "G" variants, a faster 52km/h or 28knot design basically a modified G1-A with a different hull and aft facing 3rd main turret and slightly stronger engines, but otherwise very similar to the A-140G with the same armour protection. Among the G series and among all the Yamato preliminaries A-140G2-A was the last proposal to feature an all forward modified Nelson style main gun arrangement. Similar tower like superstructure but partly Yamato-ish in style and angled funnel. Otherwise no significant changes from the earlier designs only it is 6m shorter than the previous G0-A proposal. Note: This is the first version where I decided to use the final Yamato hull form and style. I variant was the only proposal to feature 10 46cm cannons which was arranged in an inverted Conte di Cavour or Andrea Doria style meaning the triples superfiring over the twins. While this layout meant the heavier turrets located on a higher position making the ship top heavy or rising it's metacentric height, the large and wide hull counteracted such issues. This arrangement's other positive aspect was the effect on citadel armour tonnage which could be reduced due to it's shape, as the wider turrets located closer to the centre of the ship and the narrower turrets close to the ends better following the hull's shape. Among the admirals and prominent designers, Yuzuru Hiraga favoured this design due to the arrangement of the main guns and it's superior fighting qualities and ranging shot abilities. Combined Steam and Diesel propulsion, hanger aft for 6 floatplanes and a ramp to transport said planes to the aircraft handling area, 2 catapults. Together with the I and the various G variants, the J proposals too were part of Keiji Fukuda's experimental design series. While the others featured 46cm main weaponry and armour against such calibre the J variants were the only ones featuring 41cm cannons and armour belt against this weaponry, despite the admiralty requirements for 46cm armed battleship designs. The J versions starting with J0 feature 3 triple 41cm cannons in a similar sized hull and layout found in version G1-A. The J series will culminate in the ultimate 41cm-armed version of 4 triple turrets aka the Yamato-Montana. Because of a smaller armament and thinner armour the displacement of the ships could be drastically reduced by 10.000tons considerably reducing the cost of each ship and the burden on the arms industry! Continuing the 41cm armed versions of the Yamato class battleships preliminary designs, the J1 was a slight modification of the previous J0 design. Continuing the 41cm armed versions of the Yamato class battleships preliminary designs, the J2 similarly to J1 and J0 was a light modification of the previous designs. On this design the same layout was maintained and like in J1 the hull length was further increased by 11 meters to 255meters waterline and beam by 1,9 meters to 38,5 meters. Together with an increase of power plant by a mere 5,000shp to 135.000shp, the maximum speed could further be increased to 54km/h or 29knots with only a slight 1030tons increment in displacement. Otherwise the design is the same as the previous J0 or J1. Finalising the 41cm armed versions of the Yamato class battleships preliminary designs, the J3 was the ultimate evolution of this design line, featuring 4 triple 41cm turrets evenly spread forward and aft in a similar manner to the later USN's Montana class battleships. The hull was the same as the later F5 version so very close to the final Yamato dimensions. Secondary turrets concentrated aft showing a more defensive oriented thinking as attacking cruisers and destroyers most likely need to chase down the ship and for such engagements aft firing turrets are optimal. This is one of the most liked preliminary designs after the plain A-140, because it's similarities with the Montana class! Note: On this design I've used a more Yamato oriented superstructure, though still retaining the previous higher pagoda style bridge. The K versions of the Yamato preliminaries was a somewhat more extreme approach to weight saving. Indeed the K variants were the smallest versions among the multitude of designs leading to the final Yamato class but this came at a price, a price of protection. All the K variants feature 8x 46cm cannons in 2 triple and 1 twin turrets small size and reduced armour which was designed to protect against 41cm shells instead of the previous designs where they were protected against their own shells. Basically the K feature the same firepower as the A2 and B2 variants, but the protection scheme of the J versions with K being the slowest of them all, while maintaining a displacement of a mere 50.000tons! Because the hull was so small I departed from the hanger / ramp approach of the previous designs and adopted a more Yamato-ish aft section with a hanger opening to a loading space where the crane could lift the aircrafts up to the catapults ad aircraft deck. This saved precious space for the superstructure and main weaponry which took most of the upper deck space. On K1 variant the same weight saving measures were taken, so 8 guns instead of 9, 3 triple 155mm secondary gun turrets and armour protection against only 41cm shells. But in K1 the speed was increased to 48km/h (or 26knots) which resulted in a larger and heavier hull. Both the engine power and the hull length was increased to achieve the desired speed. and a slightly increased engine power together with a hull length increase, otherwise the same as the other K versions. By the end of the war, all Japanese warships received a significant number of AA upgrade both in terms of heavy AA ad light AA mostly 25mm triple and twin guns. Yamato and Musashi both were not out of the excpetion, probably these two were the most heavy outfitted vessels in the Imperial Japanese Navy. Though Musashi's AA outfit was not finished before her sunk Battle of the Sibuyan Sea 1944.10.24 part of the engagement commonly known as The Battle of Leyte Gulf. Yamato received her extra 127mm guns in march, 1944 while Musashi would had received theirs in April if there would had been enough guns. Yamato received most of her final 25mm AA suit this time but a small amount was added later in July that year and finally at the end of the year in November Yamato got her final set. During the March-April refit both ships received radar sets of Type 13 and Type 21 air search and Type 22 surface search ones. During this time their wing mounted triple 155mm gun turrets were removed to install the extra AA guns in their place. Or as I tend to call this design: Yamato-Kai. Even when the official design work began leading to the Yamato class battleships, the idea was risen to build the next generation of battleships in way that their main turrets could be replaced with and even larger calibre cannon the 51cm or 508mm cannon to maintain the gun supremacy over the United States Navy as part of the Peace Goddesses doctrine. The admiralty calculated that by the time the USN adopts the 18" cannons for their battleships the IJN already begun upgrading it's new battleships with and even larger 20" calibre weapon and start building it's new battleships which were designed from the start to carry these enormous weapons and thus maintain the supremacy in gun calibre even if numerically inferior forces they had to wield! 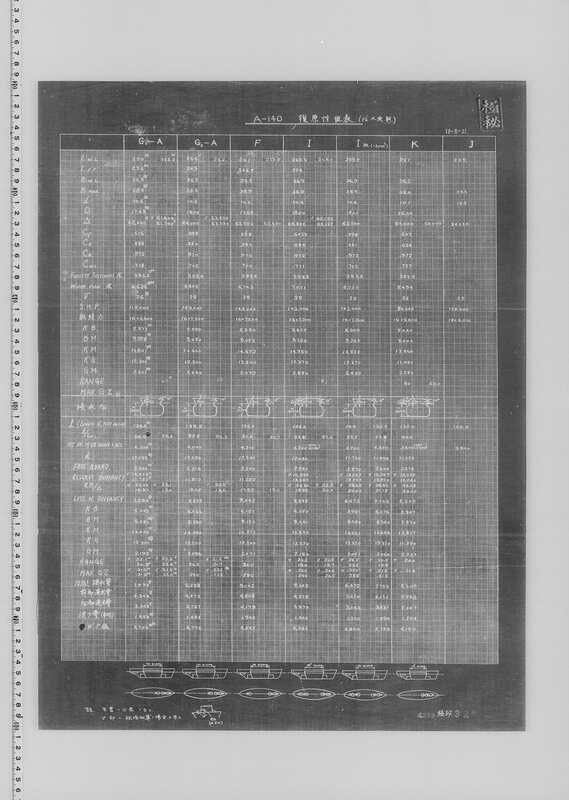 This led to the project of up-gunning the Yamato class battleships in the mid 40's and led to the famous A-150 or "Super Yamato" type battleship design of which very limited information are available due to most of the documents were destroyed during or by the end of the war. None the less I draw my idea of the up-gunned Yamatos, as shown here but taken the liberty and included the weapon and radar developments of Japan and put the Japanese copy 40mm Bofors guns in place of the now obsolete 25mm triple ones as well as large amounts of radars and radar operated directors and range finding equipment! By the time Shinano (Hull number 110) was under construction and her sister ships Hull number 111 in 1940/41 plans were drawn up to finish them to a modified design because tests shown that the armour protection of the original Yamatos were better then expected and thus by reducing the thickness protection of other vital areas like directors, gunnery positions secondary guns barbettes and the the triple bottom could be increased. In the end the displacement would not change as the saved up armour was used elsewhere. Other changes include replacement of the 12,7cm Type 89 DP-AA guns with the newer 10cm Type 98 ones which had much better ballistic properties and a better AA weapon overall. Similar to the Shinano subclass of the mighty Yamato class battleships, the 5th vessel was to be further modified based on the Shinano subtype with a further enhanced AA capabilities of no wing mounted 15,5cm gun turrets but more light AA and 10cm heavy AA guns. Yamato (and Musashi if not had been sunk) modified similar to this layout. Sidenote: I've used the darker colour scheme of the Musashi to distinguish this variant from the others.